Goa's newly-elected Chief Minister Pramod Sawant said on Tuesday that his government will pass a floor test, to be held tomorrow. 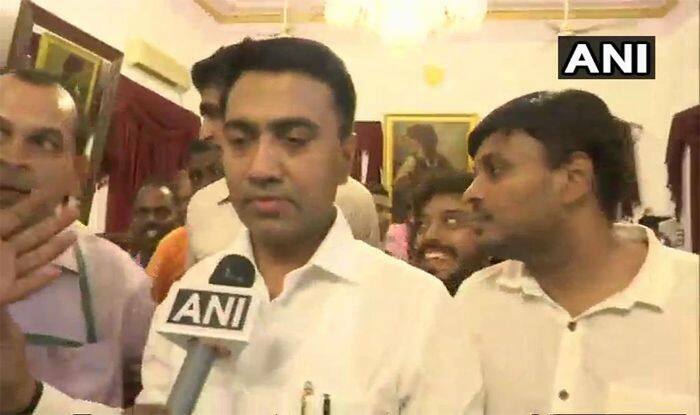 New Delhi: Goa’s newly-elected Chief Minister Pramod Sawant on Tuesday exuded confidence that the Bharatiya Janata Party-led Assembly will prove its strength during the floor test scheduled for Wednesday. “We have 21 MLAs, we will pass the floor test tomorrow. Our coalition partners are with us,” stated Sawant hours after he took oath as 11th Chief Minsiter of the coastal state. Notably, the BJP-led government in the coastal state claims support of 21 MLAs – 12 from the BJP, three each of allies Goa Forward Party (GFP) and Maharashtrawadi Gomantak Party (MGP) and three Independents. The strength of the 40-member House has been reduced to 36 due to the death of chief minister Manohar Parrikar, BJP MLA Francis D’Souza and resignations of two Congress MLAs Subhash Shirodkar and Dayanand Sopte. The governor also administered oath to 11 other ministers, including those from BJP’s allies MGP and the GFP. As per the power-sharing arrangement reached with allies, an MLA each from the two smaller parties backing the BJP will be made deputy chief minister, party sources said. They are GFP chief Vijai Sardesai and MGP legislator Sudin Dhavalikar. Meanwhile, Sawant had said the party had given him a huge responsibility and gave credit to Parrikar for his rise. “Whatever I am today is all due to Manohar Parrikar. It was he who brought me to politics. I became the Speaker and the CM today, due to him.” Sawant said the state government will build a memorial in Parrikar’s name at Panaji’s Miramar beach, where he was cremated.